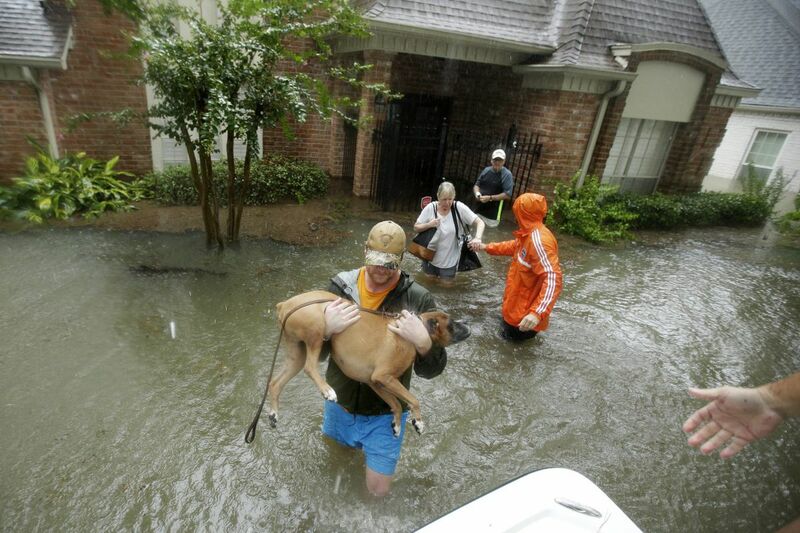 Volunteers evacuate a neighborhood in west Houston inundated by floodwaters. Several Philadelphia firefighters were pulled off their overnight shifts early Sunday. Their help was needed elsewhere — 1,500 miles away in flood-ravaged southeast Texas. Around 2:30 a.m., 45 members of Pennsylvania's Task Force 1 — 20 of whom were Philadelphia Fire Department employees — were deployed, beginning a 22-hour drive with an initial destination of Fort Worth, according to Fire Department Capt. William Dixon. From there they would be sent to help those affected by the landfall of Hurricane Harvey. The storm, Category 4 before touching land, pounded parts of Texas this weekend with high winds and relentless drenching rains, leaving at least eight people dead as of Monday. The devastation included severe structural damage to properties along the Gulf of Mexico coast and unprecedented flooding in the Houston area. Harvey, though downgraded to a tropical storm, was still dumping epic amounts of rain on the region on Monday, with as much as 15 more inches expected by Thursday — bringing rainfall amounts in some areas up to 35 to 40 inches or more. Emergency crews worked nonstop to rescue thousands of people from houses where rising waters reached rooftops. Soon after the Pennsylvania task force arrives, Dixon said, "they're going to hit the ground running." Officials in New Jersey and Pennsylvania said even more volunteers — operating under an agreement with the Federal Emergency Management Agency — could be sent in coming days. The crews could be on location for at least two weeks. New Jersey dispatched 16 of its Task Force 1 members on Sunday, as well as three New Jersey State Police personnel to manage the team, according to Laura Connolly, spokeswoman for the New Jersey Office of Emergency Management. The 16 N.J. volunteers are highly skilled in swift-water rescues — such as freeing people trapped in cars — but could also use that expertise to help in going home-to-home and rescuing those trapped in attics and other areas, Connolly said. The group will be self-sustainable for two weeks, but that time frame could be extended, she said. The team arrived Tuesday in San Antonio, which is serving as a staging area for Harvey relief. "The whole situation is so dynamic," Connolly said, "with flood levels rising and roads being impassable." The Pennsylvania task force had been slightly rerouted, Dixon said. As of Monday afternoon, that group was headed to AT&T Stadium in Arlington, midway between Fort Worth and Dallas, he said, and was 11 hours from its destination. Mechanical issues with vehicles had caused some delay. However, repairs had been made, and the group was continuing, Dixon said. The 45-person convoy included a command vehicle, three tractor-trailers, two box trucks, and two trucks pulling boats, as well as two dogs and two handlers, Dixon said. The group will not have a specific assignment until its arrival, he added. Nongovernmental aid, including faith-based operations, was also mobilizing in Southeastern Pennsylvania. Outside Lancaster, in Lititz, people at the headquarters of the Mennonite Disaster Service (MDS) were watching and waiting, communications manager Mark Beach said. The volunteer group, which is focused on long-term recovery from disasters in the United States and Canada, will send an early-response team once search-and-rescue operations are complete, Beach said. MDS director Kevin King, who is based in Lititz, planned to fly to Texas on Wednesday, Beach said, and make assessments for the group's first stage of response, having volunteers work to clean out flood-damaged houses. Beach said that if needed, additional crews will then work on long-term recovery efforts, such as rebuilding homes. Long-term recovery volunteers could come from the Pennsylvania area or even from as far north as Canada, Beach said. As the rain was forecast to continue into the week, more local volunteers could be called to help. The American Red Cross' Eastern Pennsylvania branch had sent nine volunteers as of Monday, while the New Jersey branch had sent 17. The American Red Cross of Eastern Pennsylvania expected more volunteers to be sent as the week progressed, communications director Dave Skutnik said. Two Red Cross volunteers planned to head out from Center City Tuesday morning with an emergency-response vehicle, Skutnik said. Philadelphia Archdiocese spokesman Kenneth Gavin said the archdiocese was prepared to send Catholic Social Services workers to Texas as requested, but on Monday, planning was in the early stages.